A changelog can be found here. The following programs and scripts are currently included in the package. aget            - A http download tool. AskMore         - Asks a question and saves the answer in local env. BreakForEach    - Used by ForEachLine. EndForEach      - Used by ForEachLine. FlushDevice     - Flushes cached writes to a device. ForEachLine     - Loop over each line of a file in a script. ModifyPath      - String manipulator that can get parts of a given path. on all floppydrives in a system. Reboot          - Reboots the computer. SetResult       - Sets $RC and optionally $Result2 (IoErr) to given values. sntp            - NTP/SNTP time sync utility. returned to $RC, which regular "Set + backticks" won't do. StackSize       - Prints the stack size in a format usable in scripts. SynergyClient   - Control mouse and keyboard from another computer. TCPRec          - Like TCPEcho but in reverse. TCPSend         - Send data to a host socket. time            - Very small time measurement utility. TypeLine        - Types out a specific line-number from a textfile. UHCSearch       - Master program used by the search scripts. bootablerad     - Prepares RAD: with an empty floppyimage with a bootblock. checkifsys      - Checks if a Volume/Device is SYS: or not. AmigaOS3, AmigaOS4, MorphOS or AROS. dirs            - Displays directory stack. drawertoadf     - Makes a floppy of all files in a drawer (directory). extracttag      - Can extract text from tags in markup-language files. formatpath      - Similiar to ModifyPath but uses LFORMAT-like syntax. head            - Reads the first few lines of a text-file. help            - Help-system, same as uhchelp. popd            - Retrieves the newest directory from the stack. posttoslack     - Post a message to a Slack messageboard. pushd           - Pushes current dir to the directory stack. tail            - Reads the last few lines of a text-file. uhccheck        - Checks if a new version of UHCTools is available. uhcextract      - Masterscript for extract-scripts. uhcget          - Masterscript for get-scripts. uhchelp         - Help-system, same as help. uhchtmlreadme   - Masterscript for extracting readmes from HTML-files. uhcmirrorget    - Masterscript for downloading files using a mirror list. uhcrecent       - Masterscript for displaying recent files. uhcresultpath   - Masterscript used by get/readme/extract scripts. uhcstatus       - Shows all UHC-related ENV-variables. uhctextreadme   - Masterscript for text readmes. uhctoggle       - Toggles UHC-related ENV-variables that have two states. 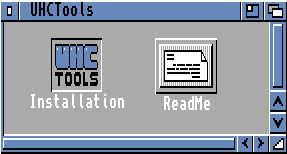 uhcupdate       - Updates UHC Tools to the latest version. of the archive and launch the apropriate unpacking-tool. aminetextract     - Downloads and extracts a file from Aminet. aminetget         - Downloads a file from Aminet. aminetreadme      - Downloads a readme-file from Aminet and displays it. aminetrecent      - Displays recent Aminet-files. aminetsearch      - Searches Aminet for files. arosextract       - Downloads and extracts a file from AROS Archives. arosget           - Downloads a file from AROS Archives. arosrecent        - Displays recent AROS Archives files. arossearch        - Searches AROS Archives for files. mosstorageextract - Downloads and extracts a file from MorphOS Storage. mosstorageget     - Downloads a file from MorphOS Storage. mosstoragerecent  - Displays recent MorphOS Storage files. mosstoragesearch  - Searches MorphOS Storage for files. depotextract      - Downloads and extracts a file from OS4 Depot. depotrecent       - Displays recent OS4 Depot files. depotsearch       - Searches OS4 Depot for files. whdrecent         - Displays recent www.whdload.de files. whdsearch         - Searches www.whdload.de for files. whdownextract     - Downloads and extracts a file from WHDownload. whdownget         - Downloads a file from WHDownload. whdownsearch      - Search WHDownload for files. scneextract       - Downloads and extracts a file from amigascne.org. scneget           - Downloads a file from amigascne.org. scnesearch        - Search amigascne.org for demo files. modlandget        - Downloads a file from Modland. modlandsearch     - Search Modland for modules. fishget           - Downloads a file from the Fred Fish Disk collection. fishsearch        - Searches the Fred Fish Disk collection for files.